Successfully Added 2pcs 55W H4 HID Bi-Xenon HI/LOW Headlight Bulbs Conversion KIT 3000-12000K to your Shopping Cart. Light Source: HID Bi-Xenon HI/LOW Bulb, Crystal glass material, low beam & high beam is on one bulb and 4-5 times brighter than halogen. Color Temperature Available: 3000K/4300K/5000K/6000K/8000K/10000K/12000K (Optional), Corresponding color Golden yellow/Yellow white/Pure white/Deep white/Light blue/Crystal blue/Deep blue. Bulb Size: H4, Our bulb meets OEM size specifications to ensure a perfect fit, Plug & Play. All in One Set: Upgraded for Car, Truck, SUV etc. for replacing halogen lamps, all in one style, no extra driver needed. Ballast Features: Slim ballasts use smaller internal components, waterproof, anti-shock and energy saving, easier to mount and more stable. 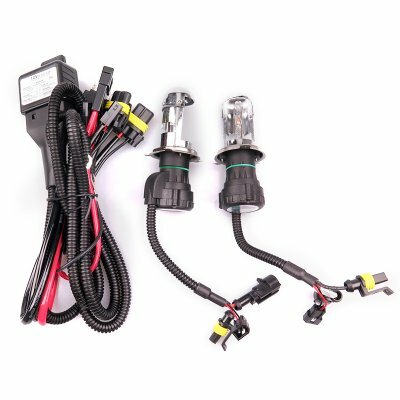 HID Bi-Xenon HI/LOW Bulb, Crystal glass material, low beam & high beam is on one bulb and 4-5 times brighter than halogen. H4 Bulb Size, Our bulb meets OEM size specifications to ensure a perfect fit, Plug & Play. Waterproof and vibration resistant. Color Temperature Available 3000K/4300K/5000K/6000K/8000K/10000K/12000K, Corresponding color Golden yellow/Yellow white/Pure white/Deep white/Light blue/Crystal blue/Deep blue. Upgraded for Car, Truck, SUV etc. for replacing halogen lamps, all in one style, no extra driver needed. Slim ballasts use smaller internal components, waterproof, anti-shock and energy saving, easier to mount and more stable.